The addition of the new zoom certainly sets the RX10 III apart, as it also includes a subtle change to the body to accommodate the lens; however, in most other respects, the new model inherits features from the previous iterations. While they’re still impressive, the III effectively adopts the same 25-point contrast detection autofocus system, along with the same 2.36M-dot viewfinder and rear 3.0” 1.23m-dot tilting LCD panel. Nevertheless, given the emphasis these models have on video — the RX10 III can also take 4K/30p movie clips, and can capture HD 1080p at up to 960 fps — it’s hardly surprising. Naturally enough, the RX10 III is bigger and heavier than its popular predecessor. It measures a still quite reasonable 5.2 x 3.7 x 5.0” / 132.5 x 94 x 127.4mm and weighs 1.53 lb. / 1051g (with battery and card). 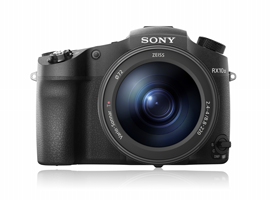 The Sony Cybershot DSC-RX10 III is available now at a price of around $1499 (USD). The new RX10 III achieved an overall DxOMark sensor score and rating of 70 points, tying with the Sony RX100 IV and RX10 II, as well as with the Canon PowerShot G7 X. Given the results, it appears to use the same or at least a related sensor. Like those models, it achieved a strong result for low ISO dynamic range at 12.6 EV, and unsurprisingly, very similar results for color depth and low light. Overall it performs very well for its class, but it’s always worth looking at the underlying results to appreciate the individual and sometimes subtle characteristics among the sensors, if any. Compared to its predecessor, the RX10 II, the new model achieves near-identical results, and that’s also the case with the Sony RX100 IV compact. In that respect it’s clear the sensor is the same or at least related, and it is the class-leading model. Of course, when we look at the underlying results in SNR and DR, all three models respond similarly — Sony evidently hasn’t done anything to tweak or differentiate their performance among these models, with the exception perhaps that the base ISO for the III is slightly lower than for previous iterations. However, that hasn’t resulted in any great gains in SNR or DR over its siblings. So while there haven’t been any advances, there haven’t been any concessions, either. The picture is slightly different against rivals using the same size 1”-type 20-Mpix sensor. The closest rival that the RX10 III has currently would be the Canon PowerShot G3 X. Like the Sony, it sports a 24-600mm equivalent zoom, but features a slower f/2.8-5.6 maximum aperture and lacks a built-in finder to help keep the size and weight down. The Panasonic Lumix DMC-FZ1000 is arguably targeting a slightly wider market than the Sony and features a less-ambitious 25-400mm equivalent zoom. Against those two models, the sensor in the RX10 III is comfortably ahead in the ratings, and the new lower ISO might not have been some arbitrary improvement after all. When we drill down through the individual metrics, we can begin to see where the Sony sensor is stronger. Although there’s some slight SNR advantage at base, the sensor in the RX10 III has notably higher color sensitivity at ISO 400-800 than either the Canon or the Panasonic. The Sony also has improved dynamic range over the older Panasonic model throughout the range, but particularly at low ISOs. The sensor in the Canon fares better than the Panasonic in dynamic range, but even with its slightly higher measured base ISO (ISO 108) over the Sony (ISO 71), its dynamic range is restricted there by a small but measurable +0.3 EV. At first glance, the RX10 III looks like a simple upgrade, but after a quick look at the specifications (and particularly those of the lens), it is so much more than that. While rivals are still scarce in this segment, the new Sony can be thought of as challenger to both the Canon PowerShot G3 X and the Panasonic Lumix DMC-FZ1000. The Sony offers the best features of both models, such as the high-ratio zoom, EVF, and 4K video capabilities, and marries those with the class-leading 1”-type BSI CMOS found on the RX10 II and RX100 IV. At $1500 or thereabouts, it’s not a casual purchase, but given the potential,s it is a tempting option when space and weight are restricted.